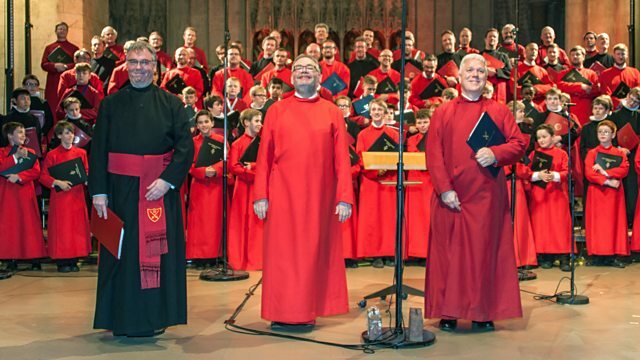 Three of the UK's finest choirs combine forces in music ranging from SS Wesley to Leonard Bernstein's ebullient Chichester Psalms. Three of the UK's finest choirs, those of St Albans Cathedral, St Paul's Cathedral and the Temple Church, combine forces in music ranging from a majestic anthem by SS Wesley to Leonard Bernstein's ebullient Chichester Psalms. Performer: Pier Damiano Peretti. Music Arranger: Franz Liszt. Choir: St Paul's Cathedral Choir. Choir: The Choir of Temple Church. Choir: St. Albans Cathedral Choir. Conductor: Andrew Lucas. Choir: St Paul's Cathedral Choir. Conductor: Andrew Carwood. Choir: The Choir of Temple Church. Conductor: Roger Sayer. Choir: St. Albans Cathedral Choir. Conductor: Andrew Lucas. Performer: Tom Winpenny. Choir: St Paul's Cathedral Choir. Choir: The Choir of Temple Church. Choir: St. Albans Cathedral Choir. Conductor: Andrew Lucas. J.S. Bach: Great Organ Works. Choir: St Paul's Cathedral Choir. Choir: The Choir of Temple Church. Choir: St. Albans Cathedral Choir. Conductor: Andrew Carwood. Performer: Greg Morris. Performer: Elizabeth Bass. Performer: Rebecca McChrystal. Choir: St Paul's Cathedral Choir. Choir: The Choir of Temple Church. Choir: St. Albans Cathedral Choir. Singer: James Hall. Conductor: Roger Sayer. Performer: Tom Winpenny. Performer: Andrew Lucas. Choir: St Paul's Cathedral Choir. Choir: The Choir of Temple Church. Choir: St. Albans Cathedral Choir. Performer: Esther Yoo. Orchestra: Philharmonia Orchestra. Conductor: Vladimir Ashkenazy.